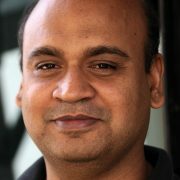 Ramachandran Ramjee is currently a Principal Researcher at Microsoft Research, India. Prior to joining Microsoft, Ramjee spent ten years at Bell Labs, USA as a technical manager and a distinguished member of technical staff. His research interests include systems, networking, wireless and mobile computing. He has published over 75 papers and is a co-inventor on over 40 patents in these areas. He is the recipient of several best paper awards and the 2010 Thomas Alva Edison patent award. He has taught two graduate-level courses in wireless networks as an adjunct faculty at Columbia University. He is an ACM Distinguished Scientist and a Fellow of the IEEE. Ramachandran received his B.Tech in Computer Science from IIT Madras, and his M.S./Ph.D. in Computer Science from University of Massachusetts, Amherst. Keynote talk titled “Green Spaces: Connecting the Next Billion Users to the Broadband Internet” at IEEE ICDCN’16 (earlier versions given as invited talk at HotWireless’15 and at IIT Delhi, Oct’15). Keynote talk titled “Context-Aware Mobile Information Access” at Infovision 2009 conference. I co-organized the MSR India Summer School on Wireless Networking (at IISc in June 2014) and the First Mysore Park Workshop on Building and Programming the Cloud (January 2010, Infosys Campus, Mysore, India). I served as the Associate Editor of IEEE/ACM Transactions on Networking (2006-2009), Area Editor of ACM SIGMOBILE MC2R (2004-2005), Associate Editor of IEEE Transactions on Mobile Computing (2001-2006) and Technical Editor of IEEE Wireless Communications Magazine (1999-2006). I taught two graduate courses “Wireless and Mobile Networking I & II” (Spring’03 and Fall’03) in the Electrical Engineering Department at Columbia University, New York. Advisors: Prof. Jim Kurose and Prof. Don Towsley. B.Tech., Computer Science and Engineering, Indian Institute of Technology, Madras, 1992.